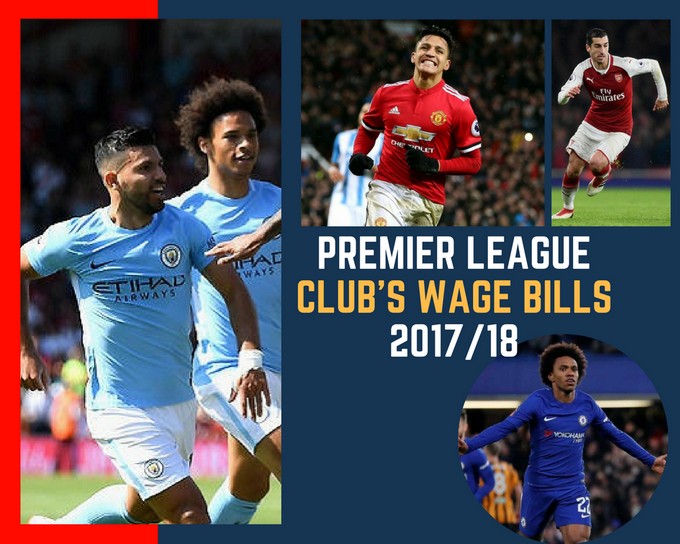 Premier League Wage Bills: Over the last couple of years, we have been able to see how major clubs tend to spend more and more money on players, no matter the sport they play. Sport is a business and recently this phrase has been embraced by all these giants. Manchester City is the prime example in England, but contrary to what many people believe, they’re not even the top spot in Premier League salaries as their city neighbors, Manchester United, top the ranking. • Jose Mourinho’s team averages £5,241,185 ($6,813,541) in annual salaries. • Manchester City ranks second with its £5,235,917 ($6,806,692). The difference is very small between both teams, with weekly average salaries of £100,792 ($131,030) and £100,691 ($130,898), respectively. As you may think, the rest of the so-called “six greats” complete the list. • Arsenal is next with its £4,037,222 ($5,248,389) and £77,639 ($100,931) respectively, while Liverpool and Tottenham (in order) finish the top six with £3,649,862 ($4,744,821), £70,190 ($91,247) and £3,154,667 ($4,101,067), £60,667 ($78,867) per side. This numbers make the EPL the highest paid football league in the world right now with an average of €50,000 weekly earnings per team. However, when we talk about the first six teams on the top, you find that not everybody manages the ir budget the same way. 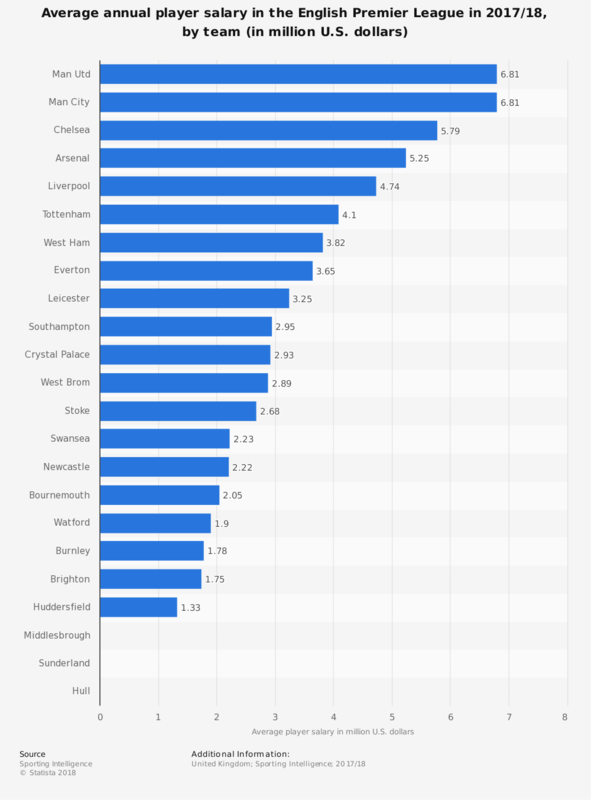 The statistic shows the average English Premier League payroll by team in 2017/18. You can see United purchasing players, renewing contracts and those practices have taken the team to decrease their earnings in certain months of the year. With their participation at the Champions League, the salary expenses went 9.4 percent higher at £69.9million. Behind the Red Devils, you can find Manchester City, which is one of the clubs that has spent most money in the last decade. Guardiola’s team is always ready to buy players and doesn’t hesitate to spend big amounts of money in order to do so. After them, we have Chelsea and Arsenal trying to keep the pace and Liverpool and Tottenham that even if they have different signing policies, ultimately have decided to go along with their rivals and spend considerable money on new assets. With the increasing competition in Premier League, teams must invest in their players in order to remain competitive as the years go by. It can be either purchasing a new agent or making a new contract to one of their figures, but there is no doubt the Premier League salaries keep growing year after year and are always object of discussion seeing the number of figures the league has right now.